Maaaate… come on… back off… like your ride, but not that close! 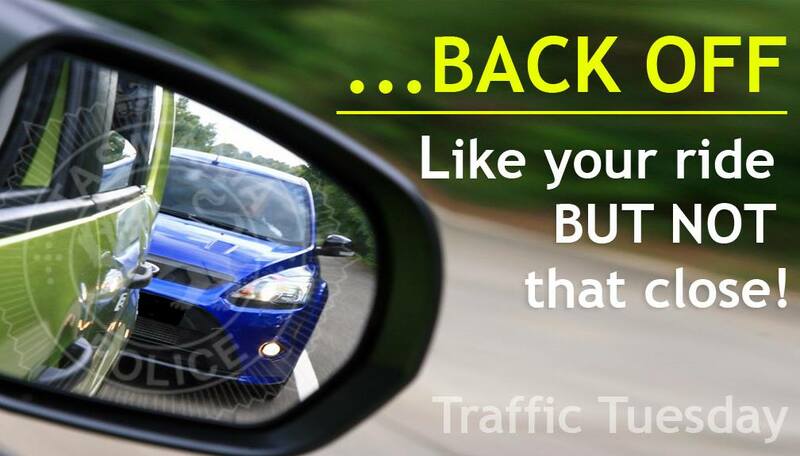 Don’t be that driver who follows another car so closely that you can’t stop safely – you risk a fine of $140 and 1 demerit point, but worse, you risk crashing and injuring or killing yourself or someone else! With ice, frost and snow on the roads recently it takes longer for a driver to stop their vehicle and it’s more likely to skid out of control on wet roads. Drivers, back off and slow down to a speed that allows you to control your vehicle especially on wet roads and double the distance between you and the vehicle in front so you’ve got room to stop. • Travelling at 60km/h or less? Leave a two-second gap between your vehicle and the one in front. • Travelling at 80km/h or more? Leave a four-second gap between your vehicle and the one in front. What does that mean and how do you know what a two-second gap is? As the vehicle in front of you passes an object on the side of the road start counting “one thousand and one, one thousand and two” – if you reach the object before you finish counting, you’re following too close. Want to follow the rule a bit closer? Check out the Tasmanian Road Rules. This page -- https://www.police.tas.gov.au/what-we-do/traffic-policing/traffic-tuesday/22-tailgating/ -- was last published on August 3, 2017 by the Department of Police, Fire and Emergency Management.